Quality ladlers play an important role in the die casting process as having an incorrectly sized biscuit can cause significant remelt costs. 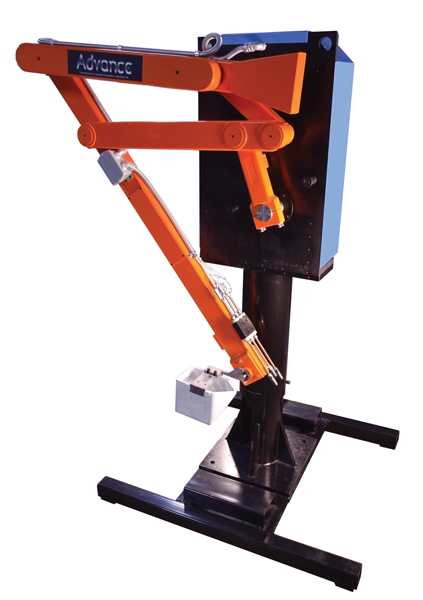 Robotic ladling systems can achieve 99+% accuracy to consistently pour molten metal from a furnace into the shot well of a die casting machine. Repeatable accuracy means lower cost of operation. Let’s compare a 60-second cycle operation for 5 days, 20 hours per day, using a 10-pound nominal pour. Ladlers with 10% repeatability for a 10-pound casting: 60 second shot x 20 hours x 5 days = 6,000 shots per week or 60,000 pounds of aluminum. 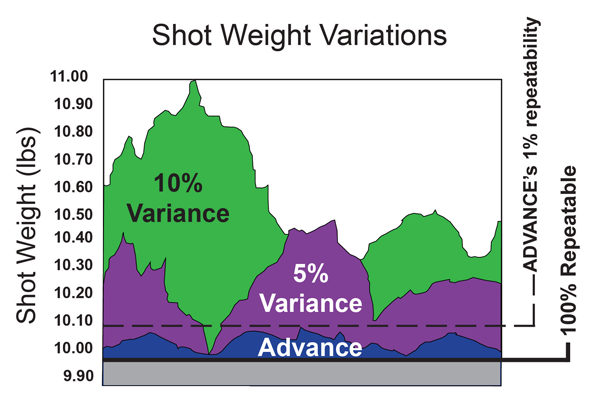 The shot weight variation would be from 60,000 pounds to 66,000 pounds (10% maximum variation) or 6,000 pounds too much. Let’s say, however, the excess average is half of that or 3,000 pounds of aluminum per week. The metal saving difference is 2,700 pounds per week. At 50 weeks per year, that’s equal to 135,000 pounds of metal you’ve purchased, inventoried, and melted unnecessarily! And these figures are only for a 10-pound casting! So what is this costing your company? One die caster stated that a biscuit 1" longer than needed (on a 2-1/2" diameter sleeve) costs about $50,000 a year (per machine) in remelt costs. 99+% can be achieved by controlling the ladle cup spill off angle with a servo motor and servo drive. One revolution of the ladle cup is divided into almost 2 million parts (1,966,000to be exact). What this means is that the cup spill off angle can be controlled to 2 millionth of its rotation and it’s this repeatability of the spill off angle that achieves the ladlers’ shot size repeatability (see Figure 1 ). 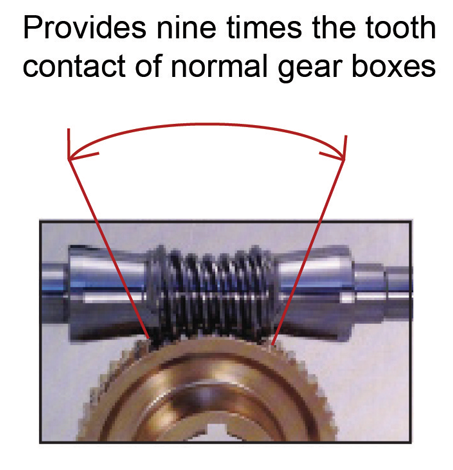 The gearbox is either a ground helical gear set or a Cone Drive double-enveloping gear set where the worm is manufactured in an hourglass configuration and wraps around the worm wheel (see Figure 2 ). Either provides low backlash and extremely long life. The brushless servo motors are directly coupled to the gearset reducing service drive train problems and improving mechanical response to the servo motors. The output shaft of the ladler linkage arms is a large, one-piece shaft, which goes completely through the gear box. The positioning encoder, motor, and gearbox are giving direct drive without use of pulleys, belts, or cam. 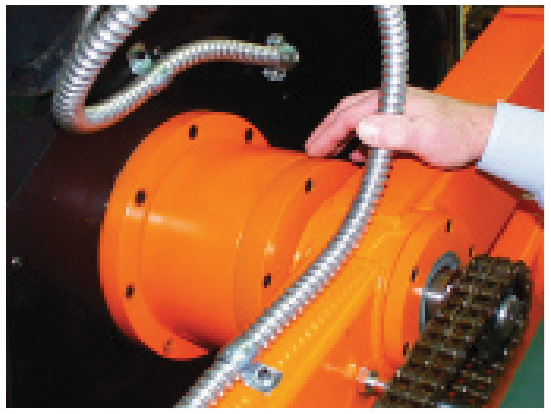 On larger models (more than 50 pounds of metal), the entire arm assembly can be supported by a large housing with double opposed tapered roller bearings (see Figure 3 ). This housing assembly supports the total weight of the arm so there is no load applied to the gear box assembly, allowing very smooth arm travel without torque interruptions. Without the weight of the arm being supported by the gearbox, the gear box works for many years. Industrial Innovations – Advance Automation has developed proprietary circuitry that prevents dunking. The smart probe (see Figure 4 ) remembers the furnace metal position from its last pour pickup. A back up probe is activated if the primary probe fails. 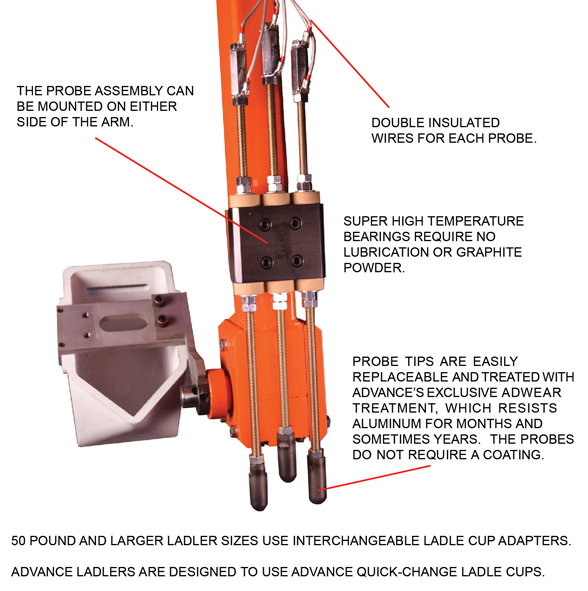 If both probes fail, the ladler is programmed to go no more than 1” lower than the previous metal pickup point. If it doesn’t sense the metal, it goes to its home position and turns itself off. The ladler doesn’t dunk, even if all the probe wires are broken. Our system consists of three probes: standard, backup, and smart. Should the standard probe fail, a backup probe takes over to prevent dunking of the arm into metal. Warning lights flash on the Operator Interface Station, signaling a probe failure. Additionally, a smart probe remembers the last metal level detected and allows the probes to advance only 1” below the last metal level sensed. If the smart probe doesn’t sense metal within 1", the ladler will dump all the metal in the cup back into the dipwell and return to the home position before shutting itself off automatically. 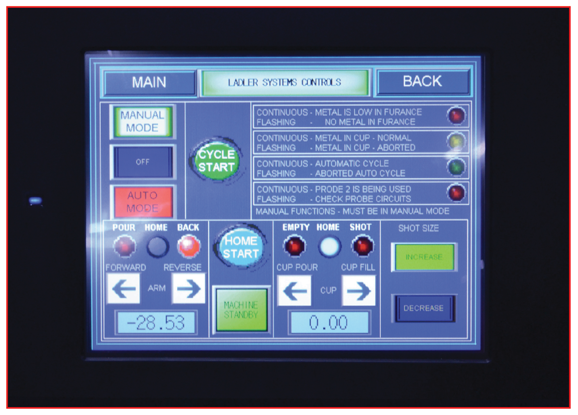 Servo Ladler operator stations are equipped with easy-to-read color LCD (see Figure 5 ). Each program should be easy to set up and be menu prompted so even operators with little or no previous programming experience can program the ladle. Typical units can store up to 500 parts programs in non-volatile random access memory (NVRAM). The Operator Interface Station allows the operator to monitor the status of the ladler and the metal level in the furnace and control all basic ladler functions. Warning lights signal probe failures, low metal levels, and aborted cycles. Indicators signal the mechanism position and ladle cup status. Controls can be set to manual or auto by turning a selector switch. A selector switch increases or decreases the shot size. Die cast, direct mount - pin-mounting design means no tools or adapters needed for changing. Die cast ladle cups are 1/4 to 5/16-inch thick, heat-treated cast iron for long life. The cups have non-wetting surfaces that are resistant to thermal shock and breakage. The cups also insulate metal from heat loss during the delivery cycle for uniform product. For long-lasting performance and value, ceramic ladle cups are die casting's best kept secret. Made from alumina-silica composition, these cups are ideal for high-temperature applications such as zinc and aluminum casting. Understanding the importance of repeatable accuracy in ladling is not hard, and there are many automated control systems available to make it even easier that guarantee the accuracy of your shot size. For more information contact Troy Turnbull at Industrial Innovations tturnbull@industrialinnovations.com.